Dentistry Options: What is Cosmetic Dentistry? Sometimes we find that the routine check-ups with our dentist just don’t meet our aesthetic needs. We may want to adjust a thing or two, improve our look, or something else. It may be that your insurance doesn’t cover cosmetic dentistry, or that your dentist doesn’t do the kind of work you’re looking for. We’re going go over some of your cosmetic dentistry options so you know what’s available and how to move forward in improving your smile. Generally speaking, cosmetic dentistry is any work done that doesn’t deal directly with oral health, dealing instead with the aesthetic appeal and look of your teeth. Cosmetic dentistryis an extremely common practice that helps people everywhere improve how they feel about their smile and their teeth. The benefit of feeling good about yourself and your smile can have effects that ripple out into the rest of your life. 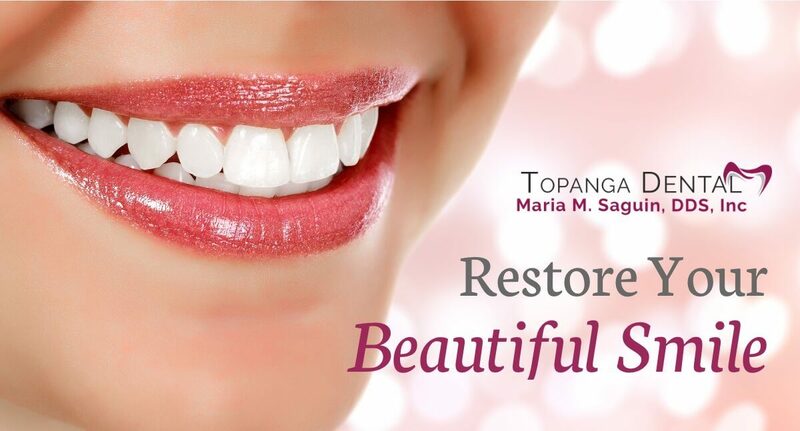 At Topanga Dental, we perform all of the cosmetic dentistry options below. Take a look at the following and see what you might like to try to feel better about your teeth and the way they look. It shouldn’t be too difficult to get your professional to work on whitening your teeth, seeing as it is inexpensive and the easiest way to improve your smile. Whitening does come in different degrees. You can talk with Dr. Saguin about getting an in-office bleach, or you can speak with her about whitening kits that you can bring home to use over time. Bonding is an option for those people who have chipped or cracked teeth and want to correct them. Bonding involves a plastic material which is hardened to compliment the misshapen or cracked parts of a person’s tooth. The process is relatively quick, although it can be a little pricey. This is an essential one for many people who find themselves with a missing tooth. Depending on where the missing tooth is located in your mouth, this could have huge consequences on your self-esteem and confidence. In many cases, people want to have their tooth replace right away. Luckily, dental implants are available for those situations where you lose a tooth. It’s reassuring to know that you aren’t out of luck when you do lose a tooth. Your cosmetic dentistry options extend far beyond what we’ve described in our list today. There’s a lot more to learn if you are interested in improving your smile. Visit our site to see your options and potentially come in for a visit and leave with the smile you want!